Every year when the winter is over and the weather gets better the first record I want to play is 'How I Spent My Summer Vacation' by New Jersey's finest The Bouncing Souls. The band celebrated their 20th birthday last year and honestly they are on of the few longstanding bands whose new records are as great if not better than previous releases. 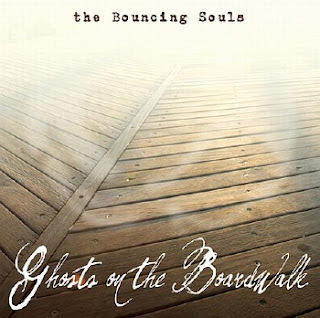 Recently they released 'Ghosts On The Boardwalk' and singer Greg found the time to answer some of my questions. Ghosts On The Boardwalk is a compilation of previous released 7” songs. Were the songs written and recorded over time or all at once? They were written from around 8/08-3/09. We kept creating as we finished up the recordings. We finished the mixes on 3 songs at a time which made the whole process a lot less stressfull. Do you see it as a full length record or really more as a compilation? Is there a difference in approach? We did think about the songs being released one at a time so our perception of them was a little different. It was fun to imagine them coming out on the first of each month so we had a slightly different attitude towards each one. We imagined each one standing on it's own. The record is released on your own label. Does this mean you’re not on Epitaph anymore? Yes. Our contract with Epitaph is done. You are around for a long time now. How do you keep yourself interested in playing shows? 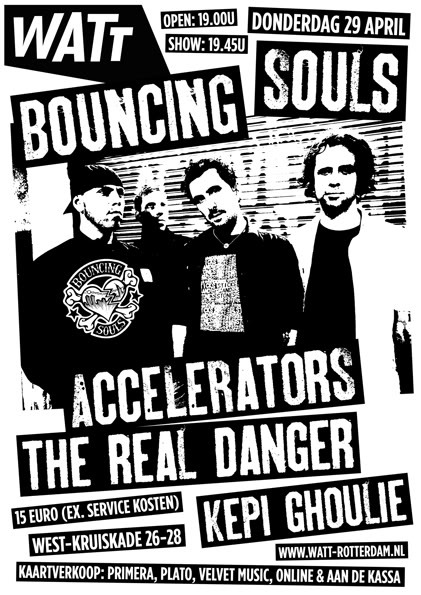 Do you think you’ll be doing Bouncing Souls for 20 more years? We love playing BS shows, We love each other, We love the music and all of our friends all over the world who come out to see us. The fun stays with as long as we dont tohr too much. We have no reason to stop playing as long as we are able to physically. When are we going to see Bouncing Souls perform opening up for Bruce Springsteen. Would you like to do that? I don't know. But that would be fun!! Acoustic punk seems to be the next big thing. You guys are pretty good in acoustic songs so when are you going to release a record like that? We have done various acoustic stuff over the years and we are talking about doing some more. We will see. At the moment I am on an acoustic tour with my wife Shanti, Kevin Seconds and Kepi Ghoulie. We will be doing some acoustic dates in Europe from April 6-13. We are listening to Kevin's new acoustic record right now on our way to a gig in Santa Barbara. It sounds great!! Check it out it's coming out May 11. The Anchors Aweigh record was partly about the attacks on New York resulting in quite a heavy record. Years later how do you look back at that period and record. ? Do you think with Obama the US is starting over fresh? Wow. That is 4 questions in one. I don't even know where to start. It's a bit complicated. When we are recording new music we usually don't look back too much. We are doing our best to express the current moment we are living in. Obama is definitely not starting fresh. The government is so full of corruption that needs to be weeded out it cant be easy to manage all of that from obama's position. It's not an easy job but I think he is doing ok so far and I support him. You have gone from an underground punkrock band to a bigger underground punkrock band. What is the biggest advice you can give, with your experience, to bands starting right now? Do what you love! Support each other and music itself!! Have fun! Get better and better at having fun! That will reflect in your music and the way you do business. Which current bands are able to inspire a bunch of guys who have probably seen it all? At the moment I'm really digging Kevin's new acoustic stuff. I'm getting more familiar with Kepi Ghoulies songs now that we have been on tour and they are so much fun. I can't speak for the other guys but that's what I have been loving at the moment. Journalist by profession, hardcorekid by heart. Married and father of two. Want me to review your demo, cd, 7" or whatever?